Remove dirt and tough stains for an outstanding, streak-free cleaning that won’t dull. It’s perfect for wood floors, furniture, cabinets, paneling and laminate floors. Spray Everyday Cleaner directly onto 4’ x 4’ area of floor. For stubborn spots, spray directly onto soiled area. Mop following grain of wood. Move to next area and repeat. Floor will dry in minutes. For best results, use a mop and microfiber pad for easier application and more effective cleaning than ordinary mops and wipes. 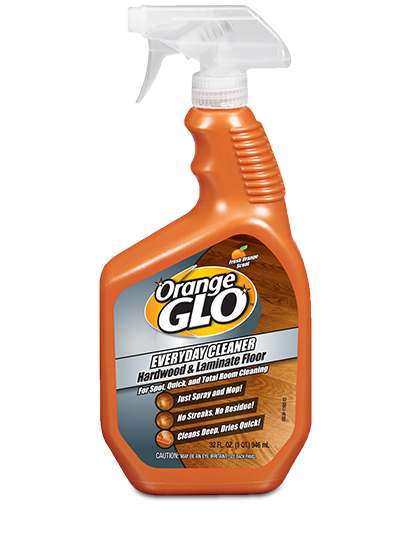 Orange Glo™ Everyday Cleaner is not for use on unfinished, waxed or oiled wood. 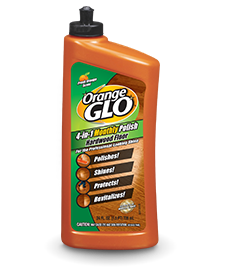 To add a beautiful, long lasting shine and protective coating, try Orange Glo™ 4-in-1 Monthly Polish. CAUTION: May cause eye irritation. Avoid eye contact. If eye contact occurs, rinse thoroughly with water for 15-20 minutes. Remove contact lenses if present after 5 minutes and continue rinsing. See physician if irritation persists. If swallowed, drink glass full of water. Contains surfactants. 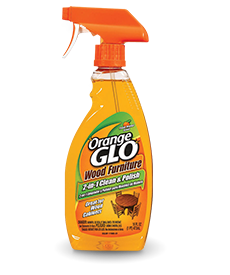 Find all the answers you need on Orange Glo™ products. Ingredient Disclosures Click Here Church & Dwight Co., Inc.